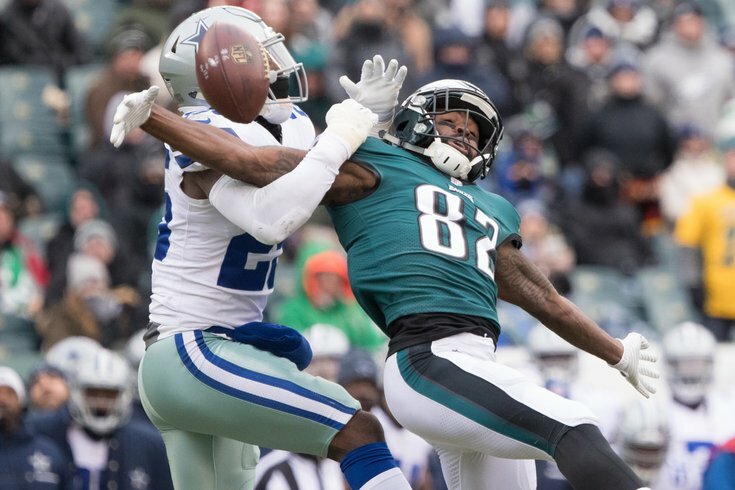 Dallas Cowboys strong safety Xavier Woods breaks up a pass intended for Philadelphia Eagles wide receiver Torrey Smith during the first quarter at Lincoln Financial Field. The Philadephia Eagles will close out the regular season on Sunday with at least a share of the best record in the NFL, and the possibility of going 14-2. However, with home field advantage throughout the playoffs already wrapped up, the Eagles have nothing to play for in terms of playoff seeding. The Dallas Cowboys have nothing to play for either, as they were eliminated from playoff contention a week ago when they lost to the Seattle Seahawks. A win in Philly will mess up their draft position, while a loss will produce Jason Garrett's fourth 8-8 finish in seven full seasons as the Cowboys' head coach. Either way, Dallas haters can point and laugh. Perhaps the most interesting storyline of this game is the fact that rookie second-round pick Sidney Jones was activated off the NFI list and was added to the 53-man roster. A source told PhillyVoice.com that Jones will play. Doug Pederson said on Friday that his starters will also play, though it remains to be seen how long they'll be out there. He noted that Nick Foles and backup quarterback Nate Sudfeld will both get playing time. The Eagles listed three players on their injury report this week. DE Brandon Graham and LB Joe Walker were listed as out. Graham was injured during the Eagles' Week 16 win over the Raiders, so it makes sense to hold him out. Walker has since been placed on IR to make room for Jones on the active roster. Jalen Mills was listed as questionable with an ankle injury. With Jones getting a look at corner, it's a good bet that Mills will not play hurt in a meaningless game. As for the Cowboys' injury report, who cares? They're done. Most sportsbooks have the Cowboys favored by three points. You can find a roundup of local, national, and Dallas-based picks for this game here. Feel free to discuss the action around the league below.